If you think they’re just teenage popstar wannabees who dress up in hipsterish clothes, sing bubbly tunes and make headlines with their female exploits, you’re wrong. They’re not wannbees, they are pop stars. And you shouldn’t hate on them too much. 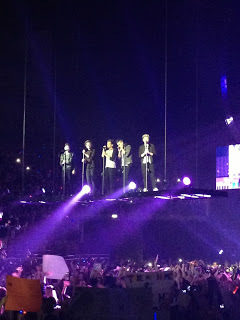 Yes, I went to a One Direction concert and I loved every second of it. I got to attend a concert in a sold-out arena for one of the most popular bands of the year (their album Up All Night did debut at No. 1 in America. No other British band, not even The Beatles, has done this) and the concert was in their “home territory” as one of the first stops on their world tour. So am I supposed to be embarrassed that I went to a 1D concert as a 21-year-old? If I am, then please talk to the 28-year-old women I saw wearing leopard print leggings who had “I heart Harry Styles” buttons on. 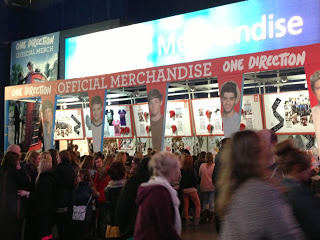 Or the many moms toting 1D purses with the faces of the boys on them. Brooke was so excited for the show she felt butterflies all day, and I’d be lying if I said I weren’t incredibly excited, too. I had always thought their songs were catchy, but it was their music videos for Kiss You and Red Nose Day that really sold me. If you don’t watch them, take my word for it: they’re so much fun. That’s what One Direction is. Fun. There isn’t much substance to their songs. They have repetitive chorus sections; predictable key changes and their ballads are sung with sad teenage puppy dog eyes. But their “fun factor” is what makes them so charming. (They did get Prime Minister David Cameron to make a cameo in their Red Nose Day video, so it’s clear their charm is irresistible). The doors to the concert opened at 6:30. Yes, you read that right. I had playfully teased Brooke that the concert was “for children,” but the rules were out into effect to help parents get their children home for reasonable bedtimes. Not too long ago, the Biebs caused quite the controversy when he was two hours late for his show. He made a lot of parents angry, and a lot of kids tired the next day at school. A lot of people had to leave the concert to get the last train home to the suburbs. 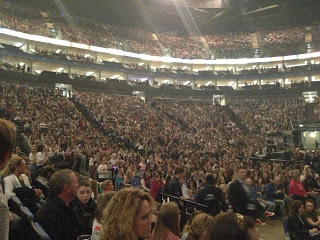 When we got to the O2 early that evening, we entered a land filled with the most enthusiastic pre-teen directioners in the world. 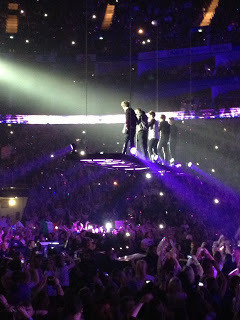 Every single girl was thrilled beyond belief to be there. Some were already crying (read: sobbing). For these directioners, the opportunity to see their favorite band in a sold-out megacomplex would make for one of the most exciting days in their lives thus far. Maybe band experiences are a little different now because of social media. Most of the girls who attend 1D’s concerts feel like they really know the boys on a personal level. They tweet at them, follow them on Instagram and have watched all of their YouTube video confessionals. 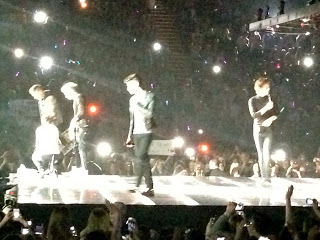 To them, this concert was their chance to show just how much they loved them. If it wasn’t made clear by all of the posters asking for the boys’ hands in marriage, it was made even more evident by the hopeful looks on all of their young faces. Before the show, they deliberately picked out special outfits, which were inspired by their Tumblr pages, in the hopes that, even though they were sitting hundreds of rows back, just maybe one of the boys would see them amongst all of the other screaming fans and want to marry them. It’s very sweet. I think that’s something we can all relate to. A deep love for music and the work that our favorite artists put out. That feeling is intensified in adolescence. We can all remember the days of listening to our favorite pop bands on endless loops in our rooms. When no one else in the world understood your younger self, you knew that you could turn to your favorite lyrics to solve your problems and give your life a little more meaning. You’ve surely heard “What Makes You Beautiful,” the song that launched the band into stardom, one million times. To you, it might just be an overplayed pop song with a catchy chorus that gets stuck in your head. But to 1D’s audience, which is 98% female and 90% under the age of 18, it’s personal. To little directioners, these words make them feel less alone in the world. Like someone can actually love them and think they’re beautiful just for who they are. There’s no time that’s more important to hear that than as a teenage girl. And this was only the beginning of the confessionals. Girls were not shy about their feelings as the concert went on. I heard many “I’m going to have a heart attack!” “I think I’m going to ex-plode!” And of course, endless “Oh my gawd, oh my gawd” refrains. The concert was deafening because of all of the high-pitched screams, but it was endlessly entertaining. The setlist is clearly rehearsed and the jokes in between songs fit in as perfect introductions to the next songs. 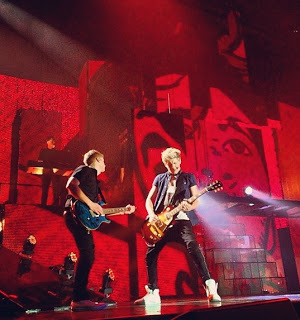 The boys jumped around the stage, sang (live, might I add) their hearts out into microphones and Niall (my favorite, obviously) even played guitar. So they aren’t completely useless musicians. It was incredible to see the parents near us mouthing the words and swaying to the music. Some were even jumping up and down alongside their grade-school children. They have played the CDs on endless loops in their cars. The lyrics have provided the soundtrack to drives to dance lessons, the grocery store and school. Maybe these parents have even left the CD in the CD player when their kids have gotten out of the car because they enjoy it. Because One Direction is fun. And we all need pure, uninhibited fun sometimes. 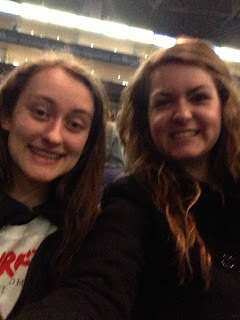 I can say that I’ve never seen my sister more happy than she was during the 90-minute, 21-song set, and I definitely rode the “1D high” home to my apartment where I gushed about how great it was to my roommates. After all, we need an excuse to scream so much we feel lightheaded, dance without a care in the world and sing at the tops of our lungs. So bring on the bubbly songs. When 1D comes to the U.S. this summer, it will undoubtedly be received with ear-piercing screams and tears from millions of devoted fans. But as long as they continue to put on energetic shows full of fun and encouraging messages, I say they’re headed in the right direction.